Do You Use the Force? Let me start with a bit of catch up for those non-Star Wars watchers: Wiki told me the force is “a binding, metaphysical, and ubiquitous power in the fictional universe of the Star Wars.” Jedi knights, in the movie, use the light side of the force to accomplish great feats such as making objects move through an invisible energy transfer or sensing danger before others. The Siths use the dark side of the force to wreak havoc in the universe and take control of the galaxies. The Jedis are the peacekeepers and only use the force when necessary to keep peace. The Siths use the force for personal power and control. That is the basic premise. Now, let me share with you my experiences with the force in dentistry. Over the next seven days, I will post my top tips for learning to use the force in dentistry and in life. It seems like a stretch to use the force in dentistry, but I am a dreamer in its fullest sense and I know, I mean, I know I am not the only one who has tried to move objects with extreme focus and concentration. And, just to let you know, I have yet to make objects move, but that does not defeat my hope, although I spend less time trying lately due to lack of free time. I have asked for help from the force in desperation a few times when I could not help a patient when he or she really needed it. I think back to a couple of intense oral surgery experiences when I could not get the (insert expletive of choice here) tooth out and the patient was about to melt down in my chair. We both needed me to get it done, and with a clear, calm ask, it happened. I call those “force moments” in my life. I don’t ask desperately like that real often, but I do ask for guidance on a daily basis, and on occasion, I ask for a great deal of guidance instantaneously. I can thank my kids for making me watch Star Wars–all six episodes. I never watched it when it first emerged. I was not sci-fi oriented, nor had any interest in watching make believe stories about galaxies far, far away. When I finally relented to their merciless requests to watch Star Wars with them, I found I had already been to this galaxy, and I liked it. Only, I got there with my yogis and meditation trainers, among others. You see, Star Wars and Dental Wars are not far from each other and both require their own set of Jedis. The training required to be a Jedi Master is very similar to the training needed to be a Master Dentist. In the past 17 years of practice, I realized all of the hand skills in the world would not help me become a Master Dentist. Hand skills certainly are needed, and should not be underestimated, but the majority of my training fell under the realm of mind training. It was my mind that needed the most help in dealing with day-to-day demands of Dental Wars, and from what I observe in Star Wars, the Jedis also seek a great deal of help with mind training. 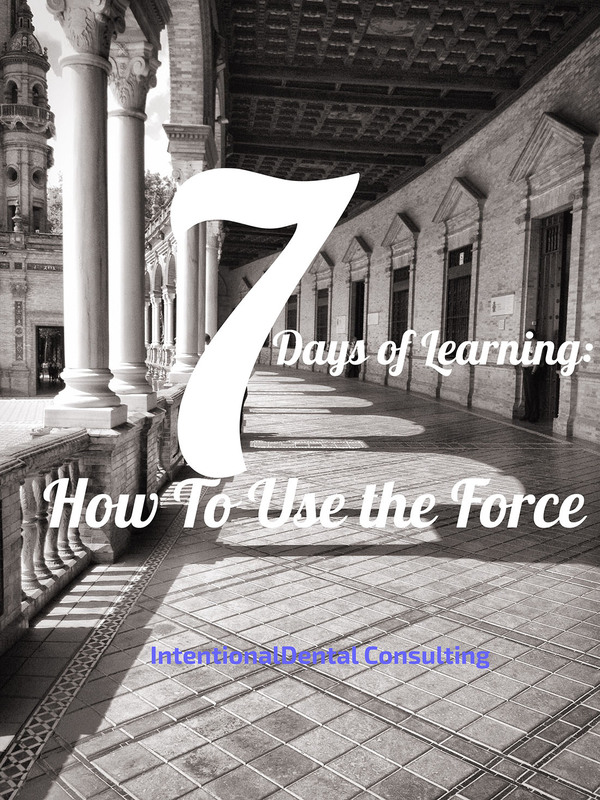 Tomorrow, you will receive my first tip in learning how to use the force in dentistry. If you sign up for my blog list (on my home page–upper right corner), you will get it right in your inbox. Or, you can come back to this site to follow along my epic dental journey and read about my most valuable lessons from my parallels with Star Wars. Stop back tomorrow for the first of my top six mind training characteristics that continue to guide me in my journey to become a Master Dentist and how they similarly compare to the training received by those longing to be Jedi Masters in the series Star Wars. Perhaps George Lucas, the Star Wars creator, secretly wanted to be a dentist. Dr. Lisa Knowles speaks and writes about all subjects beyond 32 teeth. She focuses on the dentist’s leadership skills, the team’s communication skills, and the patients’ skills in understanding their own health–specifically how their oral health relates to their overall health. To schedule a speaking session with Dr. Knowles, email IntentionalDental@gmail.com or call 517-331-3688. Dr. Knowles also offers private coaching lessons to dentists seeking higher rewards in life–both financially and personally. Learn to use the force with private lessons–a great gift to yourself this holiday season. Find more information at IntentionalDental.com.